Consumer survey results discovered by PenFed Credit Union reinforced the importance vehicle buyers place on securing a monthly payment that fits their budgets. The findings arrived as the newest Cox Automotive analysis showed purchasing both new and used vehicles is becoming a more expensive endeavor. Cox Automotive explained in a recent edition of Data Point that while mortgage rates are softening, rates for auto financing not only aren’t following that path, but they’re also increasing this month. Experts dissected the best available rates from Bankrate.com as well as information procured via Dealertrack. Through April 1, Cox Automotive found that the average rates for new-vehicle financing stood at 6.55%, which is 66 basis points higher than last year. Meanwhile, the average rate for used-vehicle financing came in at 10.84%, which is 63 basis points higher than a year ago. The increase in rates and vehicle prices are causing payments to grow even faster, according to Cox Automotive. Through March, average new-model payments climbed 3.4% to $567, while average lease payments rose 2.7% to $500. While not rising as much, average used-vehicle payments still ticked up a little less than 1% to $414. “As a result of multiple years of rate and price inflation, new-vehicle payments are far less attractive than used. The auto-loan rate trend continues to be a negative for new-vehicle sales,” Cox Automotive said, while offering more analysis here. The rate information is likely bound to frustrate consumers, dealerships and finance companies. Low monthly payments and reliability are driving automobile purchasing and leasing decisions among adults, according to a new PenFed Auto Financing Survey. The national survey conducted by Morning Consult focuses on financing priorities, buying preferences and car buying services. 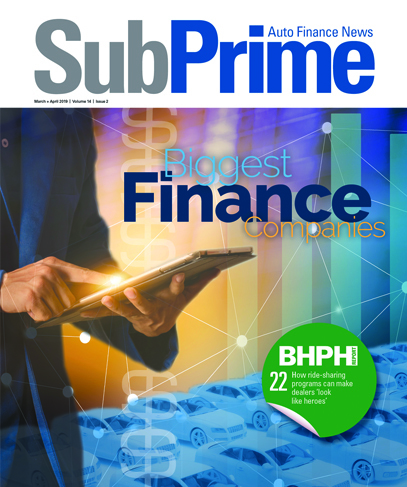 “As auto industry trends push the limits of affordability, it’s no surprise that consumers prioritize a low monthly payment when making a new buy or lease decision,” said Ivan McBride, vice president of auto lending product sales at PenFed Credit Union, which claims to be America’s second-largest federal credit union and serving 1.7 million members worldwide with $25 billion in assets. The PenFed Auto Financing Survey was conducted from March 26-29 among a national sample of 2,201 adults. The interviews were conducted online, and the data weighted to approximate a target sample of adults based on age, race/ethnicity, gender, educational attainment and region. — Almost half of adults (46%) rank monthly payments as the most important element of auto financing. — Most adults (58%) who prefer to lease an automobile do so for a lower monthly payment. — Forty-one percent of adults surveyed say the reliability of their current automobile is the biggest factor leading to their decision to purchase or lease a new vehicle. Three in four adults say the reliability (75%) and price (73%) of the vehicle factor into their decision to buy or lease a specific model. —Most adults prefer to finance vehicle through credit unions (25%), over banks (20%) and dealerships (16%). — Forty-one percent of adults would consider using a car buying service. “The best way to ensure a low monthly payment is to explore all financing options — including credit unions and innovative new programs like PenFed’s upcoming Payment Saver Plus Program,” McBride added. PenFed has seen vehicle purchases via its TrueCar partnership rise over the last year. The PenFed survey found consumers named preferring to do their own research and concerns around expense are the top reasons for not using a vehicle-buying service. PenFed Car Buying Service, powered by TrueCar, offers PenFed members cash-back offers from select manufacturers, rates as low as 1.49% APR on new models, up to $1,000 in auto deductible reimbursement for buyers and an average member savings of more than $3,300 off f MSRP on new vehicles. The PenFed survey results come ahead of PenFed’s launch of the new PenFed Payment Saver Plus Loan powered by Auto Financial Group (AFG) that provides financing with a structure similar to leasing that allows for lower monthly payment options on new and up to 5-year-old used vehicles. The program is designed to provide more flexibility as members can walk away from the balloon balance, refinance the vehicle or buy it outright if they prefer to purchase the vehicle.